A story of encounters that make a difference… How about taking a trip to Paris and a glimpse into the lives of four Parisians through the pages of a book? 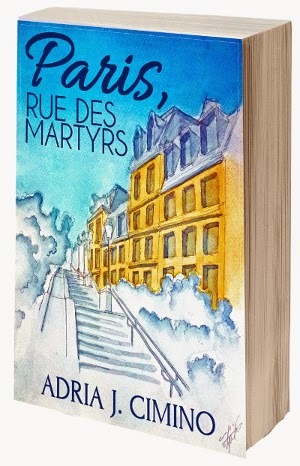 Velvet Morning Press is pleased to announce the re-release in print and ebook formats of Paris, Rue des Martyrs by Adria J. Cimino. The novel was previously published as an ebook by Agency Editions Inc.
Paris, Rue des Martyrs follows the lives of four strangers in Paris. Each one is on a quest: to uncover a family secret, to grasp a new chance at love, to repair mistakes of the past. Four stories entwine, four quests become one, as their paths cross amid the beauty, squalor, animation and desolation of a street in Paris, the rue des Martyrs. Rafael's search for his birth mother leads him to love and grim family secrets. Cecile's view of herself as an unsatisfied housewife is radically changed by the promise of a passionate liaison. Andre, an aging actor, troubled by the arrival of the son he abandoned years ago, must make a choice, to either lose his son forever or put aside pride and seek redemption. Mira travels to Paris to begin a new life and forget about love... or so she intends. Four strangers, four stories, one riveting novel. Buy Paris, Rue des Martyrs now on Amazon!